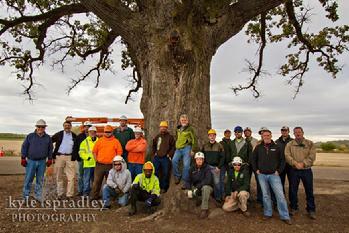 On October 22, 2013, the Missouri Community Forestry Council and a host of tree care professionals met outside of Columbia, MO to perform tree health care for what is the most widely known and photographed tree in the state, our champion Bur Oak (Quercus macrocarpa).With a circumference of 287 inches and a spread of 130 feet, this tree is estimated to be 350+ years old. Starting life as a sapling somewhere around 1660, this tree has been witness to countless moments of history, big and small, throughout its long life. Inevitably, we all begin to show our age, and this champion is no different. Several years ago the owner of Trees, Forests and Landscapes, Bill Spradley, donated time, equipment and expertise to the tree and performed much needed deadwood pruning. 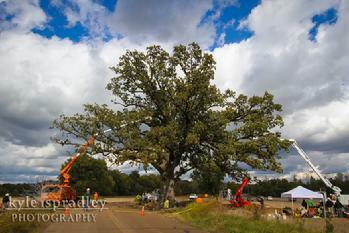 After the prolonged drought of 2012 the tree was once again in need of attention. 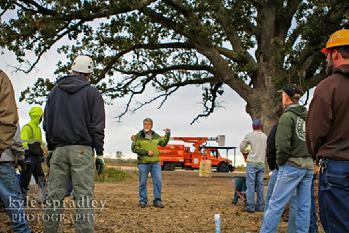 Bill knew that the tree would benefit from a more comprehensive treatment plan and turned to the Missouri Community Forestry Council for help. Through the Council’s network of tree care professionals we were able to secure sizable donations of labor, equipment, lightning protection hardware, and plant health care chemicals. 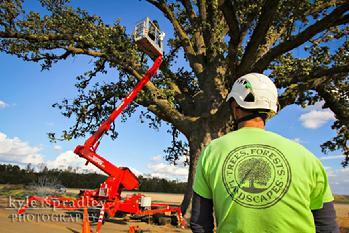 On the day of the event we had three crews in lifts as well as two climbers working in this enormous tree at the same time to prune deadwood and prepare for lightning protection installation. Once the preparation was complete, the climbers began the painstaking process of installing multiple lightning rods throughout the canopy and wiring them to the main lead running down the trunk. While the aerial work was being performed a team of volunteers were able to safely auger holes and inoculate the soil with mycorrhizae as well as spread close to 25 cubic yards of mulch, extending a few feet past the drip line! This mulch will help to reduce soil compaction caused by visitors to the tree as well as improve soil moisture retention. To finish off the day plant health care professionals from Trees, Forests, & Landscapes treated our champion with Cambistat. This chemical is a plant growth regulator which encourages increased root density and improves drought, heat, and disease resistance.